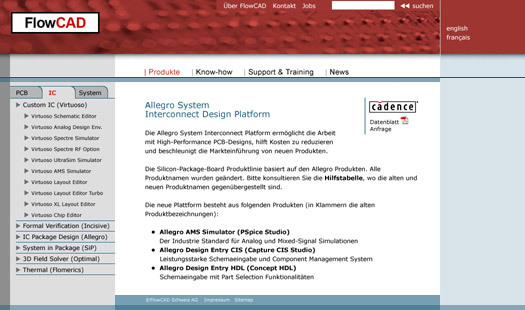 FlowCAD Schweiz specialises in the distribution and support of CAD software for the areas PCB-Design, IC, IC-Packaging as well as for complete electrical systems. A project by og3, in collaboration with Ursi Bärtsch. For this project we designed the website and created the XHTML and CSS templates to be used in the Content Management System.